Yesterday’s sun ignited temperatures close to 90 degrees in the hoop house. 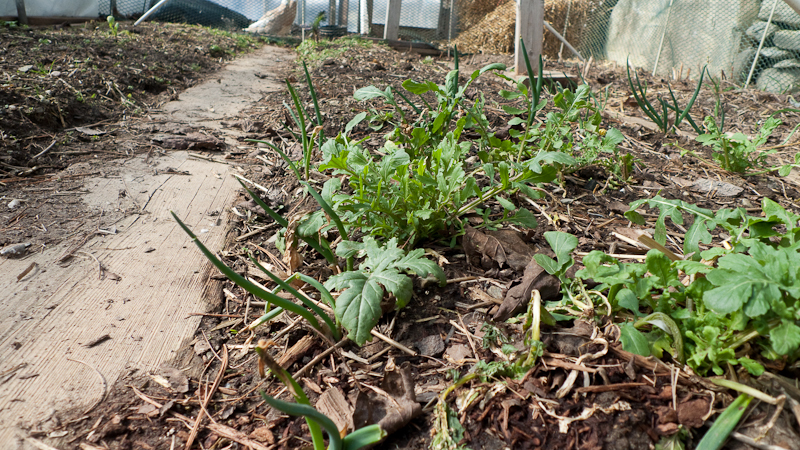 Soil is now fully thawed and the winter-weary plants are stretching out and starting to grow. It felt incredibly good to putter around, weeding,planting,watering in the sun without a jacket. With the long range forecast showing outdoor temps above freezing every day for the next ten days,spring has officially arrived in the hoophouse! Today’s early morning temps outdoors were in the high 20′s,but the hoop house was a toasty 38 degrees. 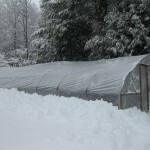 Just one layer of plastic over conduit pipe hoops,supplemented by spun polyester coverings on the beds,creates an environment for plants that is closer to Virginia than Vermont. Before discovering the Four Season Harvest system pioneered by Eliot Coleman,I hated March and April in Zone 4. Winter seemed never-ending and spring ridiculously short. Now,any time the weather goes above freezing,or the sun shines for an extended period,the hoop house warms up and I can indulge in the spring sensations we all long for at this time of year. Of course deep cold can return any time. 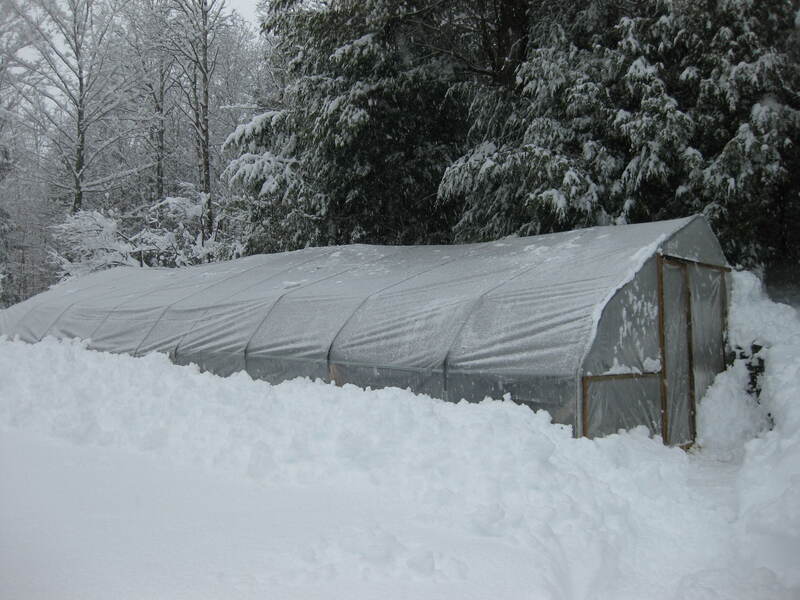 In March the past several years we’ve had sub-zero temps and heavy snows that froze the ground in the hoop house and delayed early harvests until mid-late April. This year, perhaps the mild weather will bring an earlier season of fresh salads. 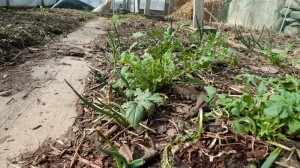 Survivors of winter - arugula and scallions. Focussing on cold hardy plants and giving them protection from cold,desiccating winds is the essence of the winter garden system. Coleman’s new book,Winter Harvest Handbook differs from his earlier book in that it is full of glossy color photos. The book is geared for commercial growers but there’s much to inspire the home gardener,though I must say his overwintered plants look impossibly gorgeous. Mine survive the winter with a hangover. Also our funky home-made hoop house little resembles his tidy and efficient greenhouses. But hey,it works for us. Continuous succession planting is another principle of the winter-garden system. Since the later plantings of spinach,parsley and lettuce in the fall failed, I have been replanting as early as possible. Arugula and other mustard greens,cilantro,scallions,mache,chervil,kale, weren’t as attractive to voles so we’ll soon be able to harvest new leaves from those that wintered-over. Perennial plants like asparagus,chives,and sage, and fall plantings of garlic and shallots in the hoop house also produce an early crop. Over the next week or two I’ll be planting every remaining space in the beds with peas,fava beans,radishes,carrots and more greens of all kinds.